Hi Everybody, can’t really believe we are actually here at the end of the year and that I managed to post a picture every day (well actually two pictures) – more on that in a minute. But first let me tell you about today’s posting. I wanted to finish on a nice picture that I captured today, but as usual family stuff got in the way (quite right too) and we went to the movies instead. This was I guess a pity as it was a beautiful afternoon and would have been perfect for a nice landscape. But such is life, no spectacular sunset today. After the movies we went out for dinner and when we got home it was dark. Next I actually thought (for about 1 minute) about driving to Seattle and getting a great shot of the fireworks over the Space Needle at midnight, but by the time I would have posted the picture it would have been “tomorrow” and wouldn’t have officially counted. So instead I made Lisa and Abi put on their coats and follow me into the garden. I took the picture below and then we got out some sparklers and light painted “Happy New Year” in the air and I put that into the picture too. I would have asked James to join us but it’s too much work to get him to participate in pictures – he’s far too cool. 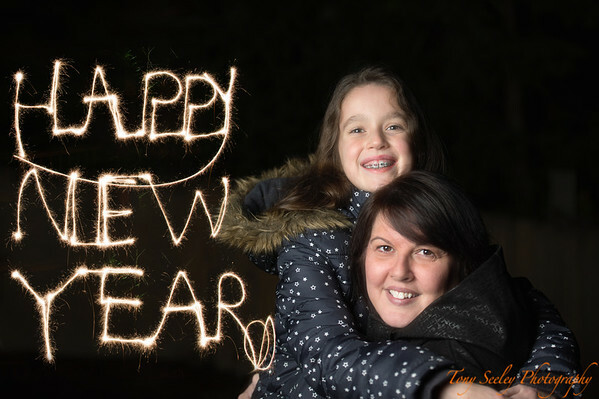 So tonight just my special ladies, with a very big HAPPY NEW YEAR from the Seeley’s. Hope you like my last image. So, back to the picture a day thing. Firstly WHAT WAS I THINKING! I must have been totally mad, no matter what anyone tells you NEVER DO THIS yourself. People will tell you that the best way to become a better photographer is to take lots of pictures. This I firmly believe is true. But you don’t have to post every day. That said (now that this is over) I can say this year has been a blast. I had some great moments capturing some pictures I really love, there was also panic and stress on those days I couldn’t think of what to shoot. And then there was that one day in September when I was in Las Vegas trying to post from 11pm and my last submit was accepted on facebook at 12:05 (huge failure). But I was really trying to post, the hotel just had crappy internet. Plus this year was a leap year so I figured you get an extra day anyway so what the heck. The Halo pictures was a really stupid thing to do. I have no idea why I decided to do this and had more pain coming up with Halo pictures than anything else. Family at home and people at work are totally sick of me asking what I should shoot, so they are all very exited that this is over as well. Wanting to be really clear (just in case some people didn’t read my very first postings of the year), I didn’t necessarily take the shot on the day I posted the picture. It started out that way but as I work for a living (yes I do Lisa), it’s very hard finding time to capture an image I really liked. So after around 5 days I changed the resolutions (and the rules) stating that the picture had to be taken in 2012. That said, many of my pictures were taken on the day or very near the day (nearly all the Halo pictures were on the day) and it was a huge undertaking. So what now? Do I carry on? (No bloody way) or stop? (Not completely). I really love photography and want to still improve and continue to capture interesting pictures, I’m just not planing on posting every day. As a result I’m going to post once a week (maybe more sometimes but I’m only committing to weekly). This will allow me to shoot when I want, rather than when I have to. It also takes the pressure off having to post daily. Oh and definitely no more Halo pictures – those guys are no longer “with me”. I really hope you liked the pictures, I like most but even I posted some that I now look at and go “nah”. 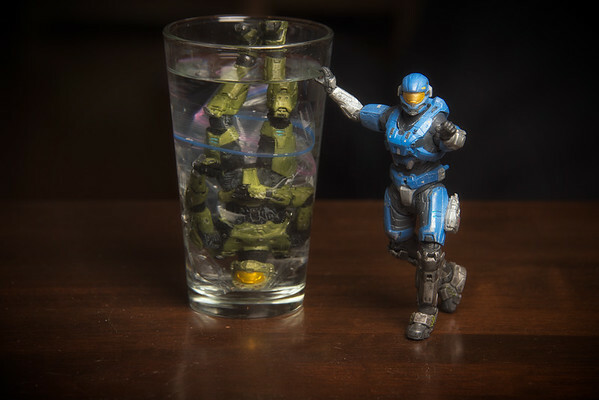 Finally, I should point out that I started my website (with all the serious and halo pictures) back on January 1st and have received over 55,000 visitors. So thank you all for stopping by, keep coming back and I’ll keep adding new images. The final demise of Master Chief was captured tonight, yes another fatality and it appears that Carter was behind it! I have to say I won’t miss these guys, 366 pictures are 365 too many, what started out as a funny idea became a nightmare as the year rolled on. Still we got through the year with a picture a day of our Halo hero’s. Hope you enjoyed the images. Lisa pointed out that I hadn’t posted many Christmas Trees, in fact I’ve only posted one and that was a couple of weeks ago. 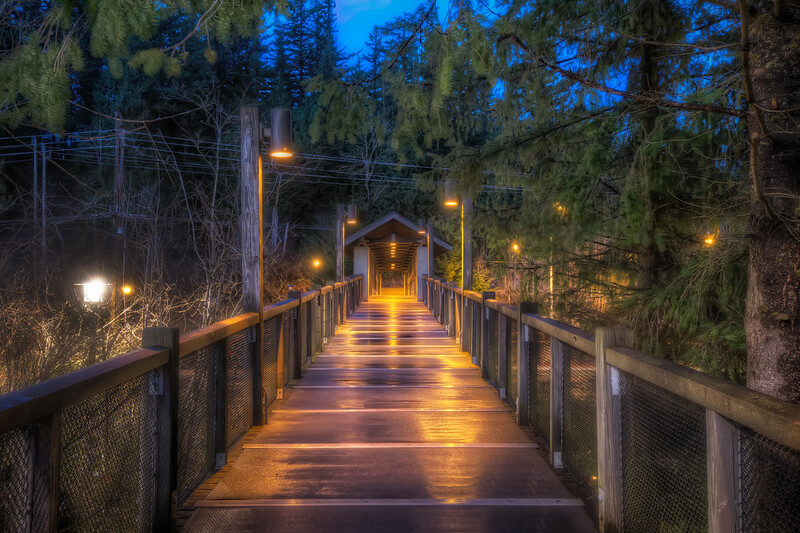 So I thought I post another tonight, this time from Salish Lodge in Snoqualmie. This large tree was just outside the hotel and an easy picture to make. 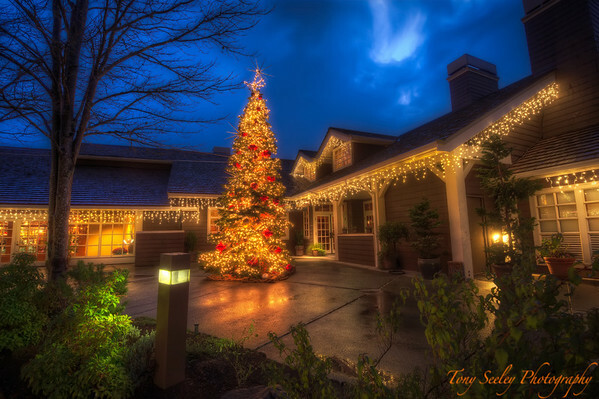 The lights around the building added nicely to the image and the blue sky looked amazing – even though the sun had set. When I got there to take the picture there were some couples standing in front of the tree taking pictures. One of the disadvantages of walking around with a camera and tripod is everyone thinks your willing to take their pictures. So one of the couples came up to me with a camera (well actually it was an iPhone) and asked me to take their picture. Usually the fastest way to get them to move on is to just take the shot. So I took their phone and took a couple of pictures. They seemed pretty happy and off they went. So I set up for the image below. I wanted some foreground interest so stood behind the flowerbeds and composed the image. This one isn’t great as I couldn’t get the picture I really wanted, as there were cars right next to me. So I got the best shot I could. The end result looks OK I guess. I like the lit up bush in the foreground with the little light, and the hotel and tree looked good. So this is my second and last Christmas tree. Tomorrow’s it folks, I post tomorrow’s picture and then plan on taking a break. I’ll also share me New Year’s resolution for 2013, so come back then. 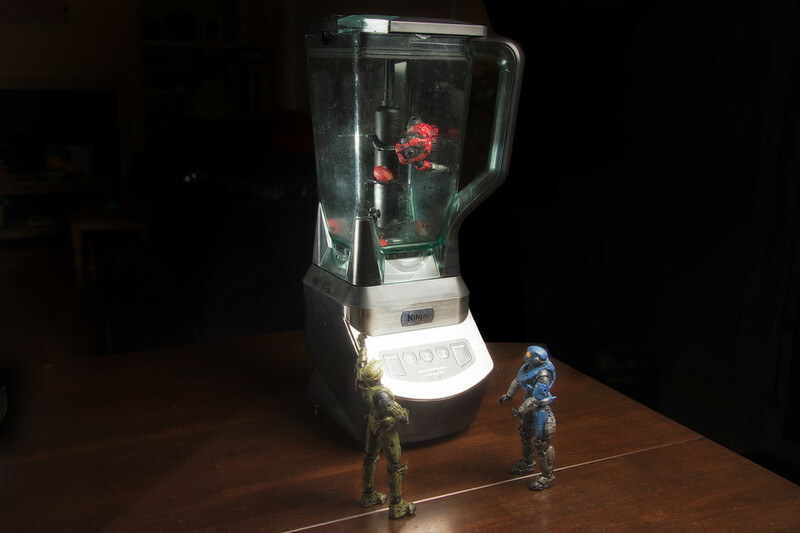 Red was found this afternoon in a “Blender”, only Master Chief and Carter left, oh dear! While visiting the Center for Wooden Boats I can across this particular item. The boat looked like it was carved out of one piece of wood and was painted pretty elaborately. I’m not sure if the markings are native American or not, but they kind of look like they could be. 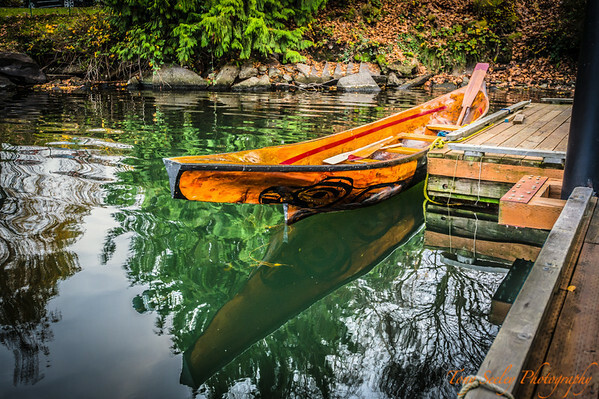 Which made me wonder if the boat was a re-creation of a native American canoe. It was moored by the bank on Lake Union and is obviously used regularly as there was an oar inside the boat and the inside was wet. Anyway I grabbed some shots – I went down to the jetty to get as close to the water level as possible so I could get a good reflection in the water. I took several pictures and then some people came out of the main building, got in the boat and pushed away from the side – and off they rowed into the lake. From this position I managed to get a lot of green reflections from the bank in the water and a reflection of the boat too. The colors of the boat were great against the water (all the oranges, browns and blacks). I liked the dock just in the picture to the right too. So the image came out quite well. This is getting worse! The guys are dropping like flies and I’m now convinced that this is no longer an accident! 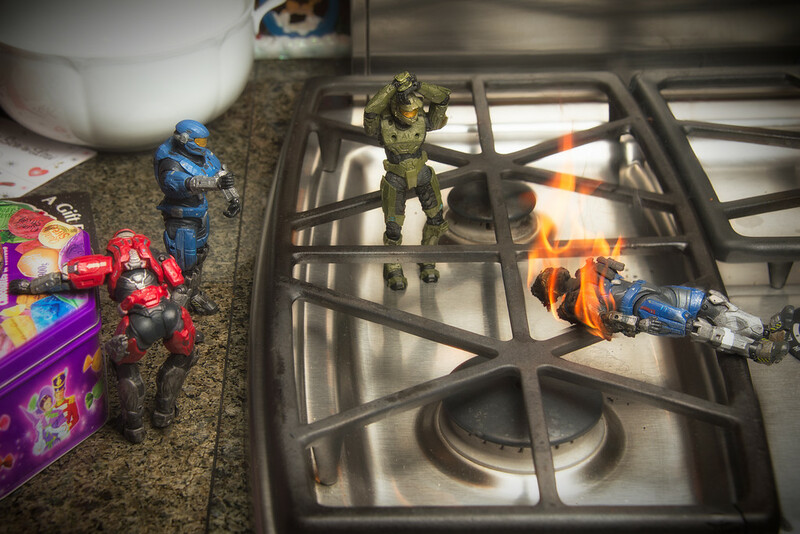 Poor Red was ill watching this, they found Carter Clone on the top of the burner – it was a mess. If you read last night’s posting you will have seen that I visited Snoqualmie and the Salish Lodge to get a picture. Well right next to the hotel is this walking bridge that crosses the main road to the overflow car park. I saw last night that the bridge was lit up and thought it might make a nice picture. So I headed up the the bridges entrance (on the hotel’s side) and set up the camera. It was a little frustrating as every time the bridge was empty and I got ready to take a shot, someone else would walk on the bridge from the other side of the road. One couple decided to stop in the middle of the bridge and watch the traffic go past underneath for a few minutes. Of course when they finally walked past me they said the usual “Oh, were you waiting to take a picture?” when they clearly knew I was. People always do that! The image came out really well. It had been raining earlier (and was just starting again when I shot this) and the bridge was wet. So all the lights along the bridge lit it up really nicely. I had to take two pictures to get this one end result. When I exposed correctly for the bridge, the light on the far left (the white one) was so bright it blew out the left hand side of the image. So I took two shots. One that gave me a great bridge, trees and sky, and one that gave me a “manageable” not-too-bright street lamp. Then I blended them together in Photoshop so the end result reflected what I actually saw. Looks pretty good too. Tonight there was another terrible accident! 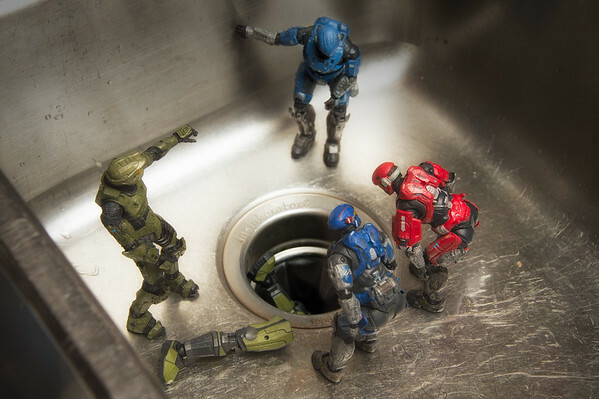 Master Chief clone was found in the waste disposal – dead! His leg was on the side and everyone started to wonder if this was an accident or if something else was going on. As the sun was setting tonight I thought I’d pop out and grab a picture for the day. It was starting to rain where we lived but my plan was to shoot at a higher altitude, so I was hopeful I’d be OK. After a half hour drive I arrived in Snoqualmie and the Salish Lodge. 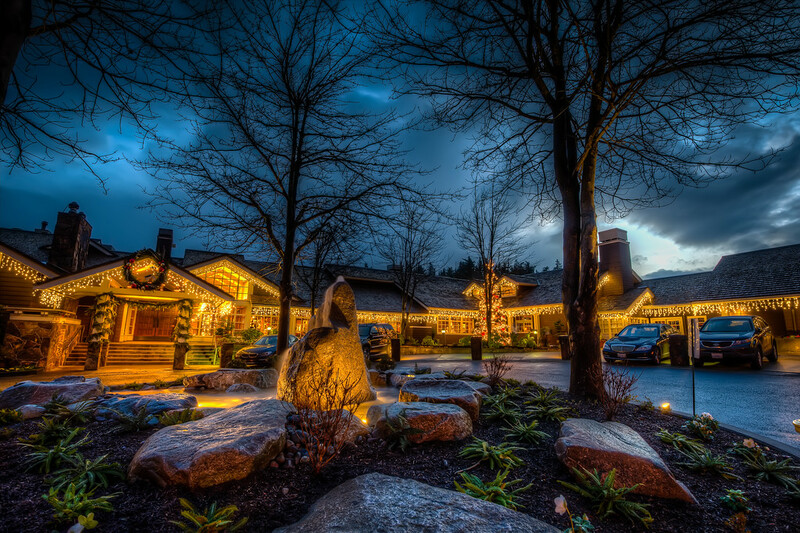 This is a really “posh” hotel right next to the Snoqualmie falls. In fact if you go back and look at my posting on October 29th (see here) you can see the Lodge at the top of the hill on the left (above the water falls). The Lodge was all lit up and looked really nice and as the sun had just gone down the sky had a beautiful blue color so I set up to take a picture. In front of the lodge is this stone fountain in the middle of a small roundabout surrounded by trees and plants and I thought it might make good foreground interest for the image. So I repositioned and grabbed the shot below. My timing was pretty good as just after I took this shot loads of people drove up and took ages to unload their cars. So this image with nobody in it was lucky – 1 minute later I wouldn’t have got it. I took a couple of other shots while there that I might share before the end of the year, but this was my favorite so it goes first. A terrible thing happened tonight, we had a stabbing in the house. 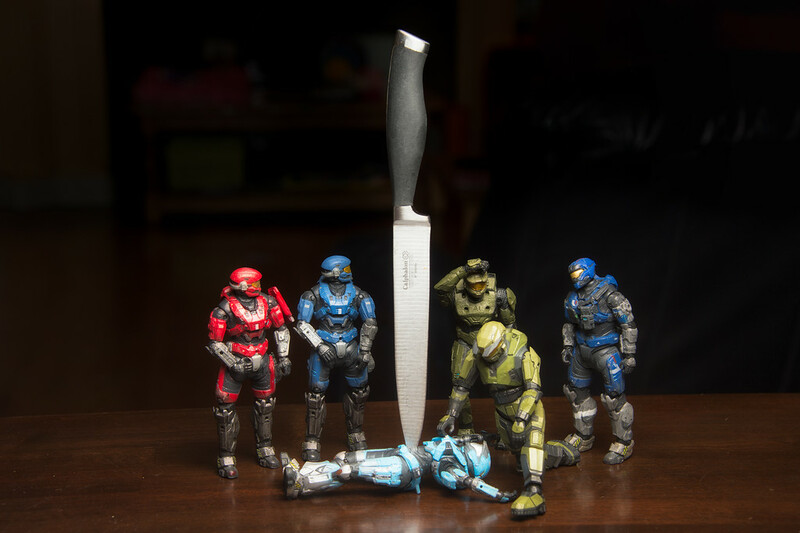 Kat (our only female Halo solider) was found with a big knife in her! What’s happening?